Bell also has sent her complaint to District Attorney Ken Mauldin. In referring the complaint to Warnes, Haygood did not pass judgment on its merits. Under the ethics ordinance, Haygood wrote, it is simply his responsibility “to determine if it is a complaint made against a commissioner” and, if that is the case, forward it to the county’s appointed Special Master. Bell argues Davis worked “behind the scenes” to do a favor for a friend. In the process, she wrote, Davis used County employee time and county money inappropriately. Moreland Altobelli Associates has billed the county for $9,991.60 to cover the design work for the possible reconnection of Old Mars Hill Road to Mars Hill Road, now under reconstruction. In addition, according to Bell, Public Works Director Emil Beshara worked “multiple days” since February of this year on the project with both Moreland Altobelli and the Georgia Department of Transportation. Bell, 1201 Arrowhead Road, east of Butler’s Crossing, challenged Davis in 2008 in the Republican primary and came within 100 votes of defeating him. 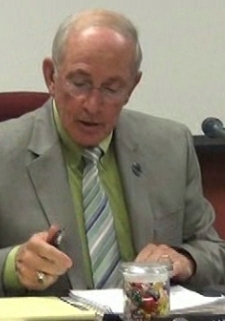 Davis was first elected Commission chairman in 2000. Bell mistakenly filed her complaint on Sept. 23 with Angela Elder-Johnson, clerk of the Oconee County Superior Court. It should have been filed with County Clerk Jane Greathouse. In the letter Haygood sent to Special Master Warnes on Sept. 28., Haygood noted the error but said the ordinance allows the Special Master to notify Bell and give her 10 days to make corrections in the complaint. Bell told me tonight she has not heard from Warnes. If Warnes “determines that material facts for which a remedy can be given exists,” he shall forward a copy of the complaint to the members of the Boards of Ethics. That board has not yet been appointed. The Board of Commissioners, following the initiative of Commissioner John Daniell, passed the ethics ordinance in October of 2010. Bell’s complaint is the first that has been filed since the ethics ordinance went into effect. Haygood copied Chairman Davis and the other four members of the Board of Commissioners in his letter to Warnes. Bell gave me a copy of that letter on Thursday night. She had given me a copy of her complaint to Olens, Mauldin and the county on Sunday night. I had not known of the letters until that time. Bell frequently makes video recordings of meetings in the county that I use on this blog. I have not been able to confirm that Mauldin has received the letter Bell addressed to him. Bell gave me a copy of the reply from Olen’s office in response to the letter she sent to Olens. ●Put loyalty to the highest moral principles and to county above loyalty to persons, party, or county government department. ●Never discriminate unfairly by the dispensing of special favors or privileges to anyone, whether for remuneration or not. ●Engage in no business with the government, either directly or indirectly, that is inconsistent with the conscientious performance of governmental duties. ●Uphold these principles, ever conscious that public office is a public trust. ●Never engage in other conduct which is unbecoming to a member or which constitutes a breach of public trust. ●No county commissioner shall knowingly withhold any information that would impair the proper decisionmaking of any of the county’s boards, agencies, authorities, or departments. ●County commissioners, as policy-makers, shall refrain from unduly interfering in the daily administrative affairs of department supervisors. Commissioners shall not give directions or make suggestions to the department supervisors or other employees on an individual basis. All directions should be made in accordance with the County Organizational Policy. ●No county commissioner shall grant or receive any special consideration, treatment or advantage for themselves or any other citizen beyond that which is generally available to other citizens in the same or similar circumstances. County commissioners found in violation of the ethics code can receive a written warning, censure, or reprimand and be forced to make repayment to the county of any unjust enrichment. The Board of Commissioners on Tuesday night let die the proposal to connect Old Mars Hill Road to Mars Hill Road opposite Barber Creek Drive. According to email records I received through an open records request, Public Works Director Beshara sent an email to County Administrative Officer Jeff Benko in September of last year saying he had met with Perry Aycock “per Melvin’s request.” In the county's organizational chart, Beshara reports to Benko. Aycock owns four lots on Old Mars Hill Road. Davis subsequently asked Benko to follow up on that contact, and Benko ultimately instructed Beshara to move forward on the project. Davis brought the project before the Board of Commissioners for approval only when the state informed the county that it would have to agree to pay $115,000 for the construction of the interchange. Beshara told the commissioners the county would have to contribute another $15,000, bringing the total project cost to $140,000. Thanks to people like you and Ms. Bell who try to foster integrity in our county government operation. As they say, "It's a hard job but somebody needs to do it." I'm glad you are both well-informed enough to know how to go about such as this. "County commissioners, as policy-makers, shall refrain from unduly interfering in the daily administrative affairs of department supervisors. Commissioners shall not give directions or make suggestions to the department supervisors or other employees on an individual basis. All directions should be made in accordance with the County Organizational Policy. " What next? Davis is a joke and seems to use his position to bully and do whatever he wants. Sure hope there will be someone with the interest of the citizens instead of his our agenda. Thank you Sarah Bell for doing what the rest of us thought needed to be done, but had no clue how to do it. This may not go anywhere, especially if Mr. Davis appoints the Board of Ethics (would he put on Boswell and Bishop? ), but filing the complaint was a great thing to do. Thank you Ms. Bell for having the courage and conviction to try and reign in the all powerful out of control King Melvin. He has apparently been making deals and promises behind the backs of the other commissioners for sometime now and no one has been able to find a way to stop him. I hope that this will. I pray that there will be no backlash and no harm will come to you for doing what many have felt needed to be done. People of power can be very vindictive when they are caught with their hand in the so called "cookie jar". You and yours be safe and watch your backs! Lee makes it sound bad. Not sure if/when all the facts are out that there is anything that would come of this. A "special favor to a fried" as it alleges is really a gray area and would probably be hard to prove. Good for Sarah Bell! Lee isn't making it "sound bad", he gives the facts; if the facts sound bad, so they are. Secrets in governmental operations will come back to bite those perpetrators. There really is no "gray area" in government, as anonymous said, but rather it's black and white, especially in this instance when Davis gave one, ONLY one, property owning citizen preferential treatment and spent almost $10,000 county money on such without proper approval. It's a puzzlement that an ethics ordinance was put in place 5 years ago and no board has yet been selected. Why the delay? When those in our county government refer to Melvin as "father",someone to be obeyed without question, you know there is something mighty wrong.